General William Grover Moore Jr., is commander in chief of the Military Airlift Command, with headquarters at Scott Air Force Base, Ill. As commander of a specified command, CINCMAC is responsible to the president and the secretary of defense through the Joint Chiefs of Staff for the planning and performance of airlift missions during wartime, periods of crisis, and peacetime exercises. In carrying out this mission, he directs the management of all strategic and tactical airlift forces worldwide to insure operational support to unified and specified commands engaged in military operations. During routine peacetime conditions airlift service is provided by the commander MAC, through the secretary of the Air Force, in his role as executive director of the Single Manager Operating Agency for Department of Defense Airlift Service. In this capacity, he is also responsible for air rescue, air weather, aeromedical evacuation and combat documentation and audiovisual systems throughout the world. 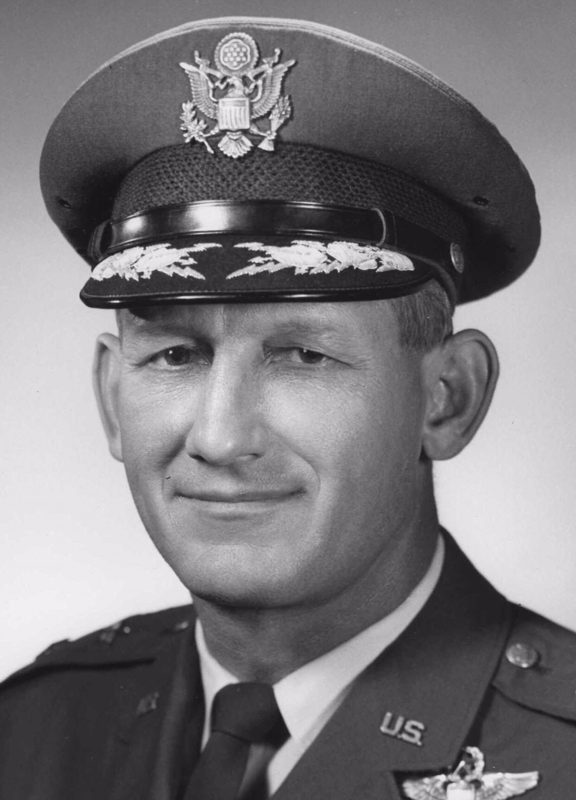 General Moore was born in Waco, Texas, in 1920, and began his military career in 1940 by enlisting in the Army Air Corps as an aviation cadet. He graduated in May 1941 with a commission as a second lieutenant. During World War II, General Moore commanded the 777th Bombardment Squadron, 464th Bombardment Group, Fifteenth Air Force, in Italy, logging 35 combat missions in B-24 Liberators. 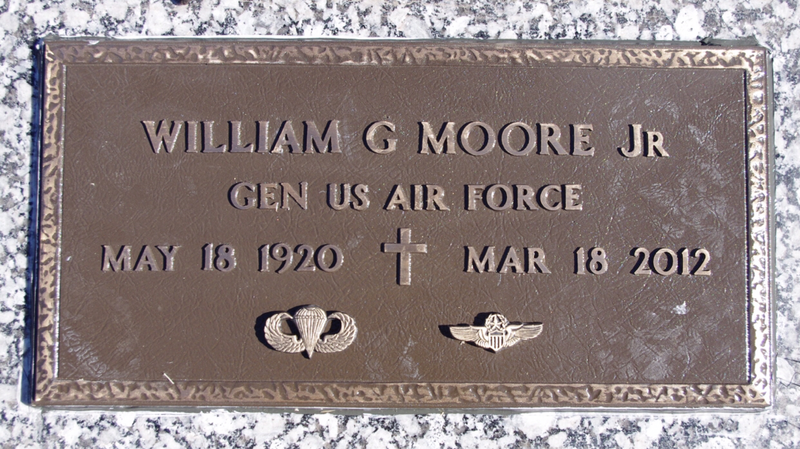 After World War II, he served as commandant of students at the Army Air Forces Aircraft Observer and Bombardier School at Mather Field, Calif.
During the Korean War, General Moore commanded the 3d Bombardment Group based at Kunsan, Korea, from where he led 65 combat missions in B-26 medium bombers. 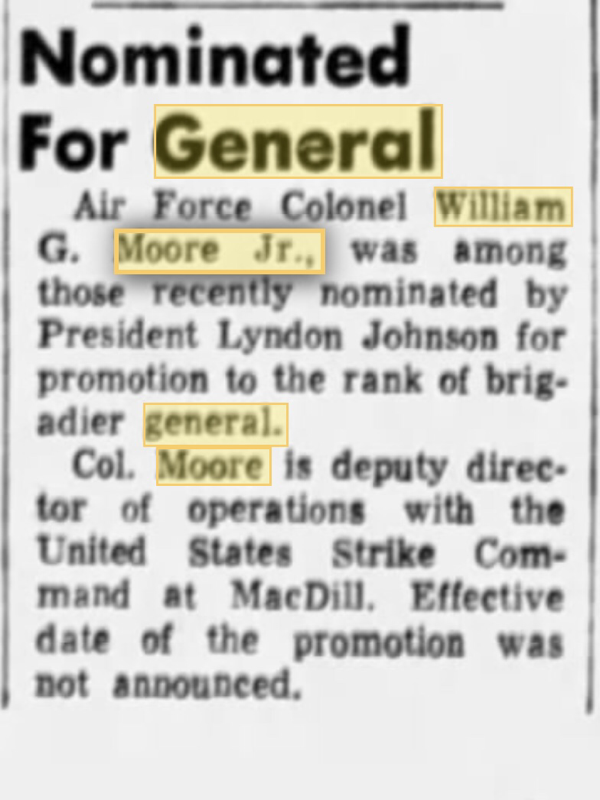 From January 1953 to August 1956, General Moore served at Headquarters U.S. Air Force, Washington, D.C., in the Directorate of Operations, and from August 1957 to 1961 he was assigned to Headquarters U.S. Air Forces in Europe, where he served as assistant deputy chief of staff, operations. He entered the National War College, Washington, D.C., in August 1961. 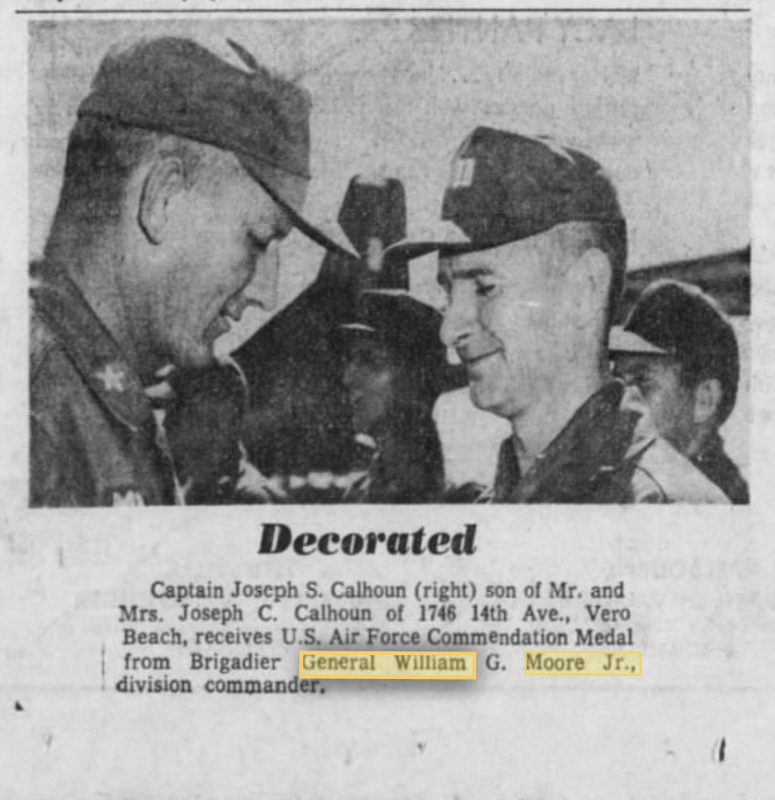 In August 1962 General Moore began his airlift career as commander of the 314th Troop Carrier Wing, Sewart Air Force Base, Tenn. During this time he also completed airborne training at Fort Benning, Ga. 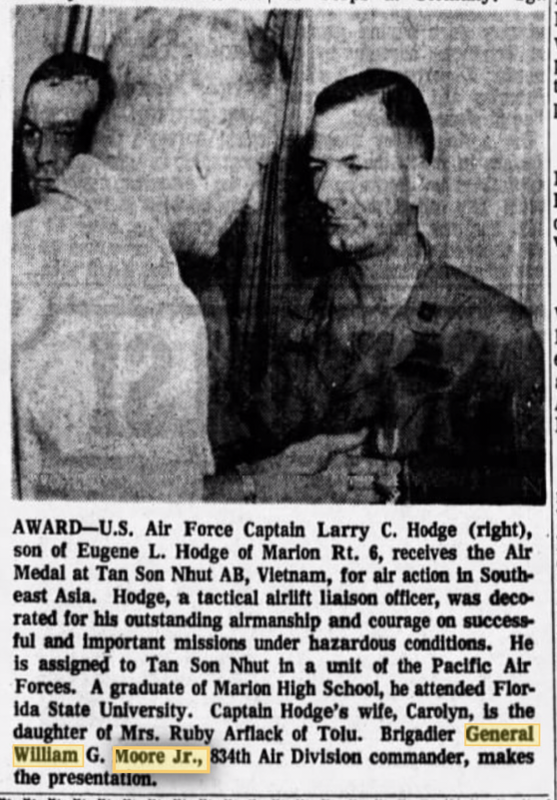 In September 1963 he became commander of the 839th Air Division. While at Sewart, General Moore directed Project Close Look, the springboard for today's tactical airlift tactics and procedures, and served as airlift commander on several large scale exercises including the Big Lift deployment to Europe. From March l965 until October 1966, General Moore was the deputy director of operations, J-3, U.S. Strike Command, MacDill Air Force Base, Fla., where he commanded the test airlift exercise Rapid Strike and was instrumental in much of the airlift planning for joint operations. In November 1966, General Moore was assigned in Vietnam to organize the airlift effort in support of the Southeast Asia conflict. He reactivated and commanded the 834th Air Division at Tan Son Nhut Air Base, with responsibility for all tactical airlift in Vietnam. In December 1967 he assumed duties as director of operational requirements and development plans, deputy chief of staff, research and development, Headquarters U.S. Air Force. In February 1970 he became commander of the Twenty-Second Air Force (Military Airlift Command) at Travis Air Force Base, Calif. There he had prime responsibility for the extensive strategic airlift flown from the continental United States to Southeast Asia. During this time, he also flew more than 900 hours in the C-141. While he was Twenty-Second Air Force commander, the world's largest aircraft, the C-5 Galaxy, entered the MAC inventory and a C-5 squadron was activated at Travis. 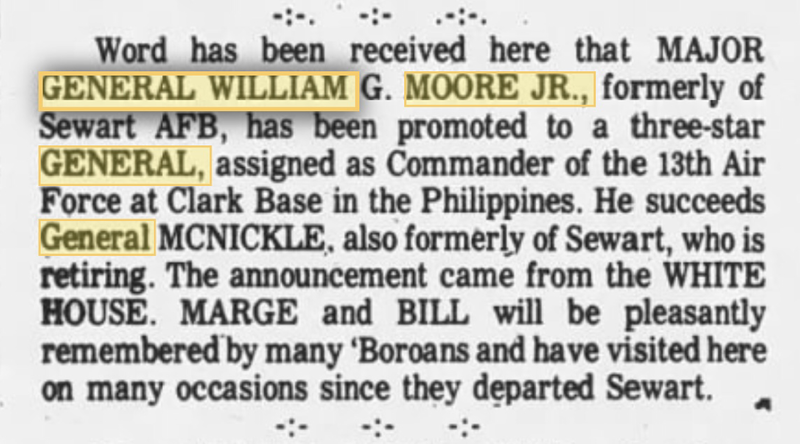 In September 1972 General Moore assumed command of the Thirteenth Air Force - at Clark Air Base in the Philippines - known as the Jungle Air Force. He was responsible for U.S. Air Force units in Taiwan, Thailand and the Republic of the Philippines. C-130s under his command were the first aircraft into Hanoi to prepare for returning prisoners of war, and he commanded the homecoming operation at Clark Air Base under the direction of the commander in chief, Pacific Command. 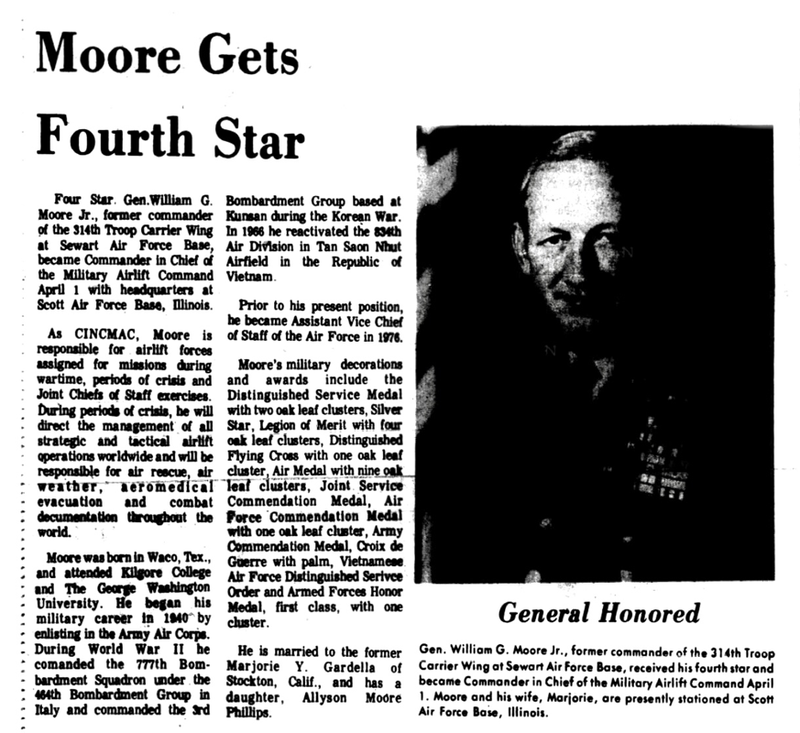 General Moore was assigned as chief of staff, Pacific Command, in October 1973. He participated in the planning and execution of numerous missions: complex airlift efforts for resupply of Cambodia; evacuation of Phnom Penh and Saigon; Operation Babylift; Operation New Life; and the Mayaguez operation. 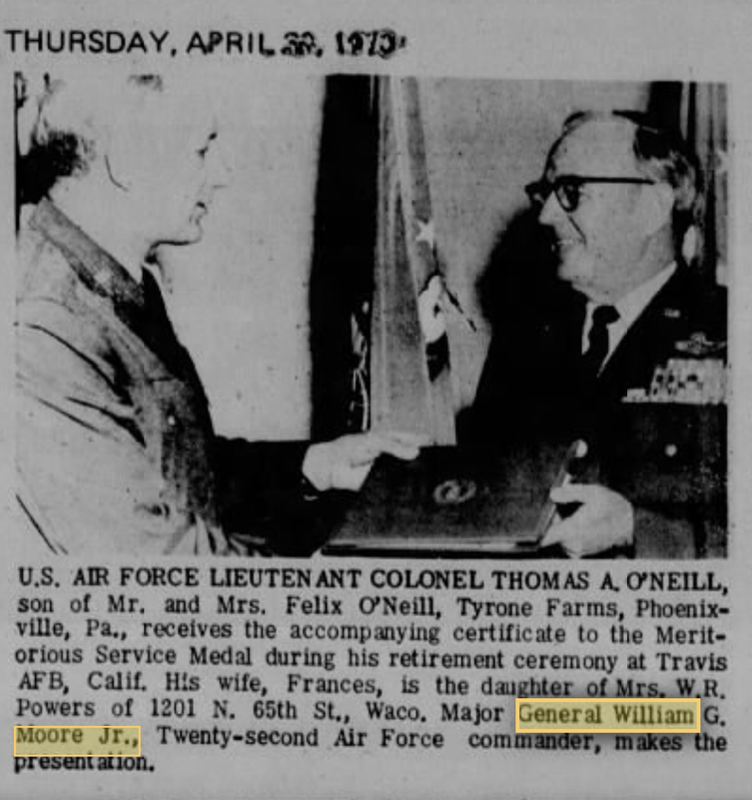 He became assistant vice chief of staff, U.S. Air Force, with the additional duty of senior Air Force member, Military Staff Committee, United Nations, in October 1976. He assumed his present duty on April 1, 1977. Since that time, MAC airlift operations have included missions such as relief to the snowbound northeast United States; major force deployments to New York, Europe and Asia as part of joint service exercises; surge of C-141 airlift forces during Exercise Reforger; withdrawal of Americans from Ethiopia; search efforts for the Soviet satellite which crashed in Canada; airlift of United Nation's peacekeeping forces to the Middle East; airlift by C-5 Galaxy of a superconducting magnet direct from Chicago to Moscow, and the U.S. airlift to Zaire. General Moore is a combat veteran with 100 missions flown during World War II and the Korean War, and more than 140 missions in the Vietnam conflict. 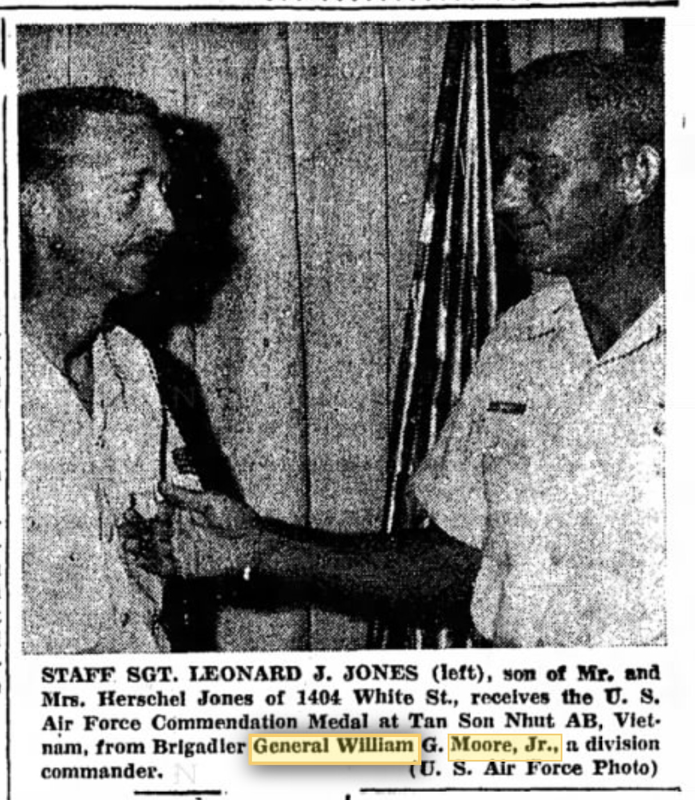 His military decorations and awards include the Distinguished Service Medal with two oak leaf clusters, Silver Star, Legion of Merit with four oak leaf clusters, Distinguished Flying Cross with oak leaf cluster, Air Medal with nine oak leaf clusters, Joint Service Commendation Medal, Air Force Commendation Medal with oak leaf cluster, Commendation Ribbon, Croix de Guerre with palm, Vietnamese Air Force Distinguished Service Order, 2d Class, and Vietnamese Armed Forces Honor Medal, 1st Class, with cluster.